With its population of 584,153 according to recent census data, Wyoming is the least-populated state in the U.S, despite being the 10th largest by area. The state's largest city is Cheyenne, with the metro area home to more than 62,000 people. According to Census Quickfacts, the percentage of adults with bachelor's degrees in Wyoming is 24.7 percent, slightly below the national average of 28.8 percent. The U.S. Census Bureau estimates that in 2013, Wyoming also had a poverty rate of 10.9 percent of all residents, below the national average of 14.5 percent. According to the Bureau of Labor Statistics (BLS), the state also had a 4.2 percent unemployment rate as of July 2015. Furthermore, the Census Bureau estimates that Wyoming median household income from 2009-2013 was $57,406, above the national average of $53,046. Additionally, according to the Bureau of Economic Analysis, Real GDP increased by 5.1 percent in 2014, making the state's growth among the highest in the country. Wyoming is a leader in the mining sector, which expanded 3.52 percent in 2013-2014. Other important economic sectors include tourism and agriculture. The state's high rate of economic growth, education, and household income, as well as the low unemployment mean that Wyoming can be an excellent place to live, work, and pursue higher education. 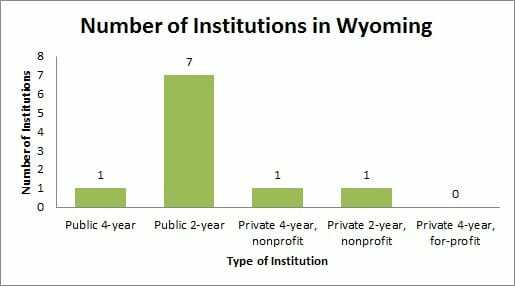 More specifically, according to a 2014 National Center for Education Statistics (NCES) report, federal financial aid-eligible colleges and universities in Wyoming granted 7,165 degrees and certificates to 6,519 graduating students in 2011-12. Among those students, 42 percent earned their degrees at four-year institutions and 58 percent earned two-year degrees. The number of students earning certificates from less-than-two-year institutions was not statistically significant. The most recent data provided by the National Center for Education Statistics Integrated Postsecondary Education Data System (NCES IPEDS) indicate that the state had 37,812 students enrolled in active postsecondary institutions in academic year 2012. Almost all of these attend public institutions. According to NCES IPEDS, of postsecondary students at the University of Wyoming, the percentage of undergraduates attending college full time was 82 percent in fall 2014, and the percentage of undergraduates going to college part time was 18 percent. At the state's two-year institutions, approximately 65 percent attend part time and the remaining 35 percent are full time. Online education has become increasingly prevalent since the turn of the century. At first, many people both in and outside of higher education felt that the quality of online coursework was not as high as that of traditional instruction. While this may have been the case initially, like any new technology, however, quality and ease of use have improved quickly. Both the quality of the material being delivered as well as the delivery methods themselves have improved significantly in the last decade. Innovations such as massive open online courses (MOOCs) have allowed colleges and universities to increase course enrollments without sacrificing quality, particularly for lower-level, general education requirements. This means that course content can now be delivered online conveniently and inexpensively, and first-time students as well as professionals interested in continuing education are all taking college coursework online. Indeed, choosing an online education may be more cost-effective than a traditional college degree, and often allows students greater flexibility, both educationally and in other aspects of their lives. Even traditional colleges and universities in Wyoming now offer courses in hybrid and fully online formats, both at the individual course level and for entire programs and degrees. This has given students the opportunity to achieve their educational goals even if they do not live near the particular college, university or vocational or technical school in Wyoming that they would like to attend. Even students who live outside Wyoming may choose to attend schools in the Equality State, if they determine that an institution there is the best fit for their needs. By 2008, nearly 25 percent of all postsecondary students in the United States were taking online courses, and by 2012 over 7.1 million postsecondary students nationally were taking at least one online course. According to the NCES, in colleges in Wyoming, 4,228 students were enrolled exclusively in distance education courses, while 6,718 more were enrolled in at least one distance education course. That's over 28 percent of all post-secondary students in the state at the undergraduate and graduate levels. Statewide, particularly southwestern Wyoming and Casper. According to the BLS, the mean annual wage in this occupational category in Wyoming is $101,420. Typically, general and operations managers have a bachelor's degree in business or a related area such as hospitality management, leisure studies, human resources, or finance. A master's degree may be required for more advanced positions or at larger organizations. According to the BLS, this occupational category has an annual mean wage of $27,100 in Wyoming. However, more than 8,000 workers are employed in this category statewide. The level of education required depends on the industry and an individual's goals. Those selling technical or very expensive items may need postsecondary coursework to familiarize them with the product and industry terminology. Those interested in advancing into management positions may need a college degree in an industry related topic or in management. In Wyoming, the mean annual wage for registered nurses is $60,790, above the state's average annual household income. Individuals wishing to become more competitive for registered nursing positions may want to obtain a bachelor of science in nursing, although other educational paths are available. Registered nurses must also be licensed. The southwest and northeast of the state. The Bureau of Labor Statistics (BLS) indicates that this occupational category pays an annual mean wage of $36,820 in Wyoming. For many such positions only a high school diploma and on-the-job training are required. However, Individuals wishing to become more competitive for bookkeeping positions may want to become certified in bookkeeping and the software they will use on the job. Postsecondary coursework or a bachelor's degree in accounting may also be useful, especially for individuals interested in advancing to positions as accountants or auditors. Statewide, but particularly in the southwestern and southeastern areas. The Bureau of Labor Statistics (BLS) indicates that this occupational category pays an annual mean wage of $34,170 in Wyoming. For many such positions some coursework in basic office skills from a technical or community college and on-the-job training are required. Depending on the industry (medical, legal, etc.) then additional coursework to familiarize one with the technical terms may make one more competitive. Executive secretaries may need to complete a bachelor's degree as well as several years of work experience. Other job categories of note in Wyoming include operating engineers and other construction equipment operators, maintenance and repair workers, teacher assistants, and first-line supervisors of construction trades and extraction workers. Proof of state residency and other requirements may have to be met to verify eligibility for state financial aid programs. In 2013-2014, Federal Direct subsidized and unsubsidized loans were being offered at an interest rate of 3.86%. Private student loans may also be available at a variety of interest rates, depending on an individual's creditworthiness. Currently, private loans may offer lower interest rates than federal loans do, but this may change in the future. Additionally, federal student loans typically have a wider variety of repayment options and other generous repayment benefits that may be better than those offered by private lenders. For example, federal loans have consistent rules regarding eligibility for forbearance and deferral. Individuals with federal student loans may also be able to participate in Pay As You Earn (PAYE), a repayment program that caps monthly loan payments at a set percentage of one's income. PAYE also offers forgiveness on the balance after a set period of on-time payments. On the other hand, private lenders may or may not offer forbearance and deferral programs, and are not eligible for PAYE. However, some private lenders may offer similar benefits to federal loans, so individuals should read offers carefully and ask questions about any terms or conditions that seem unclear. Regardless of their ultimate career goals, prospective students should seek a regionally accredited institution if pursuing a traditional academic degree. Accreditation is one of the primary ways the quality of an institution is judged. There are six regional accreditors in the United States. In Wyoming, the accreditation body is the The Higher Learning Commission of the North Central Association of Colleges and Schools (HLC). 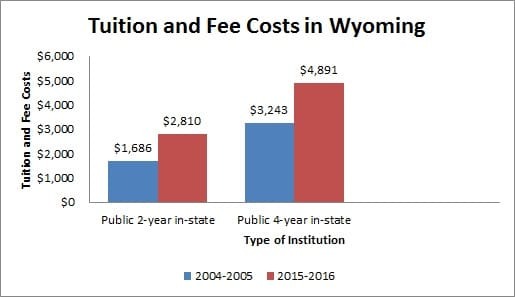 While Wyoming used to have a reputation for allowing institutions without regional accreditation to operate, according to the Chronicle of Higher Education, "in 2006 the state enacted legislation requiring all private higher-education institutions to seek federally recognized accreditation within five years." The law has since been upheld by the state's Supreme Court. In addition to state and federal forms of financial aid, prospective students should remember that colleges and universities as well as private organizations may offer financial aid opportunities. Eligibility may vary, but investigating any and all opportunities is prudent. Rarely will sources of aid approach eligible individuals directly, so students should expect to be proactive in this process. Usually, students receive small awards from numerous sources, rather than one large award covering all their costs. Though it may be more work upfront, seeking out grants and scholarships that do not have to be repaid is a better long-term financial choice than simply taking out student loans, which can have a negative effect on one's finances post-graduation. To find out more about some of the schools and programs available in Wyoming, be sure to check out the ones featured in our school listings below.